Well, has, technically. I have a little lamb. It's smaller than my cat, and it's also dead in case you couldn't tell. When I started working on her, she was covered in feces and pretty gross, but I am thankful that someone chose to donate her to me rather than tossing her in the trash because she's an absolute angel. I think she died shortly after birth, and due to her short stature I'm assuming she was a twin or even a triplet, which isn't all that uncommon in many species and breeds of sheep and goats. Right now the project is about halfway done, but I wanted to share my progress so far! The first photo is the lamb, fresh out of the bath, with my staple tools: bone shears, a scalpel, and a Victorinox knife. The taxidermy process is just like learning anything else. It seems daunting at first, there are a lot of different ways to do it, and with enough practice and the right teacher you can go pretty far. There aren't deep, dark secrets in this trade but a lot of taxidermists have their own techniques. I'm not sharing all of mine, but everything you see is a pretty widespread technique. The first step after cleaning any feces or debris off your specimen is to skin it, flesh it, and tan it. 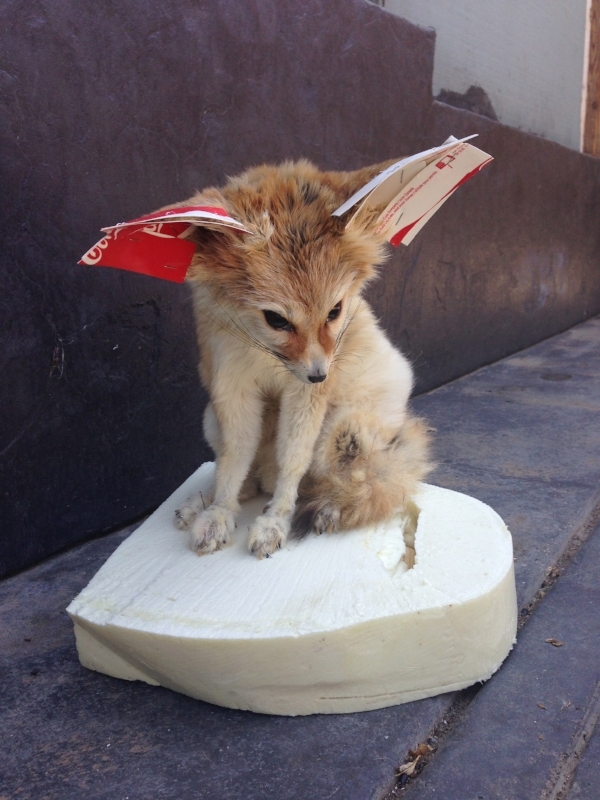 There are many different tricks that taxidermists have for these processes, and typically larger animals are fleshed before and after being sent to a tannery, but for small animals like this I have a non-caustic tanning solution that permeates the skin deep enough to allow me to flesh after I tan the hide. Here we see the clean, smooth inside of the lamb after both tanning and fleshing. You can also see that I have split and turned the ears, which means I have turned them inside out and carefully removed the cartilage. Remember that block of foam from the photo before this one? I carved it using the skull for reference, then added glass bubble eyes and clay. The clay is meant to emulate the muscle structures in the face and head, and accurately fill out the face in a realistic way. Pictured above is the lamb's face during a fitting of the form, where I made sure all of the facial features were in the right place. The eyelids and lips still need to be tucked, and earliners still need to be inserted and glued in place. Here I am wrapping the core of the form, using nothing but water, excelsior, and twine. You don't need to make huge investments in casting custom forms. It's a fun process, but experimenting in wrapping forms is fun (and much faster). Everyone has their preference and it's a good idea to learn how to make a body multiple ways. This is how the form looks when it's about halfway done. Add more layers, wrap, add more, wrap - until you get it all right! This shows the form with the legs added on. The wires are very long and each leg gets two wires each, which poke out between the cloven hooves and add stability during drying and then display. This is a shot I took and sent to a friend, with my hand next to the lamb for scale. One leg was sewed closed, but three legs and the belly still needed to be done. Additionally, the lips and eyes and ears still needed to be positioned. Here is the lamb during the drying process. "Carding" the ears involves using a P3 stapler or pins to hold cardboard against the skin so it stays sandwiched against the ear liner during the drying process. The pins stay there for about three weeks while everything sets in place. This is my last photo of the process so far. The pins and cardboard have been removed, and now the lamb can be finished. I will use a process called sweating to rehydrate a part of the lip that shrunk in a funny way, allow it to dry again, and then use a combination of putty, paint, and shellac to finish the eyes, nose, mouth, and ears so the little one is ready for display. Pictured next to the mostly-done lamb are a baby chick and an anthropomorphic baby rat in progress. I've never been a huge fan of anthropomorphic taxidermy, but this is the project that changed my mind. More on that soon! Anyone who knows me knows a few things about me: how much I love a challenge, and how much I admire my esteemed colleague Chuck. About a month ago, I visited Chuck in his studio in beautiful Ojai, California. As is tradition, we dug a bunch of things out of his freezer - and one of those things was a fennec fox. Hailing from Africa, Vulpes zerda is the smallest canine species in the world. They are a desert-dwelling animal and max out at approximately three and a half pounds. In the United States they are revered as exotic pets, and select zoos also have fennecs in their possession. The fur was so matted that I couldn't use a comb to untangle it. In fact, I had to use a stout rougher - a spiked tool so sharp that it cut holes in my palms - just to get some of the knots out. The tail literally fell off in three pieces because it was one giant dreadlock but eventually the knots in the rest of the pelt gave way and despite how much fur fell out, I was able to make it look alright again. In the meantime, to give my palms a break, I used a cast done by Mike Frazier of Research Mannikins as a reference for carving foam to replicate the skull of the fennec. I set the eyes (raccoon eyes!) into the foam form, then imitated the musculature of the eyelids using clay. The photo below shows my carving next to the cast, whereas the photos above this paragraph show the carving after it had been inserted into the fox's face. The addition of clay, a keen eye, an artistic touch, and a good tool kit are where the magic begins to happen. I use plain clay and a solid set of tools that I've curated over the years. I sell curated tool kits - please email hello@mickeyalicekwapis.com if you are interested in reviewing options and purchasing one for yourself. 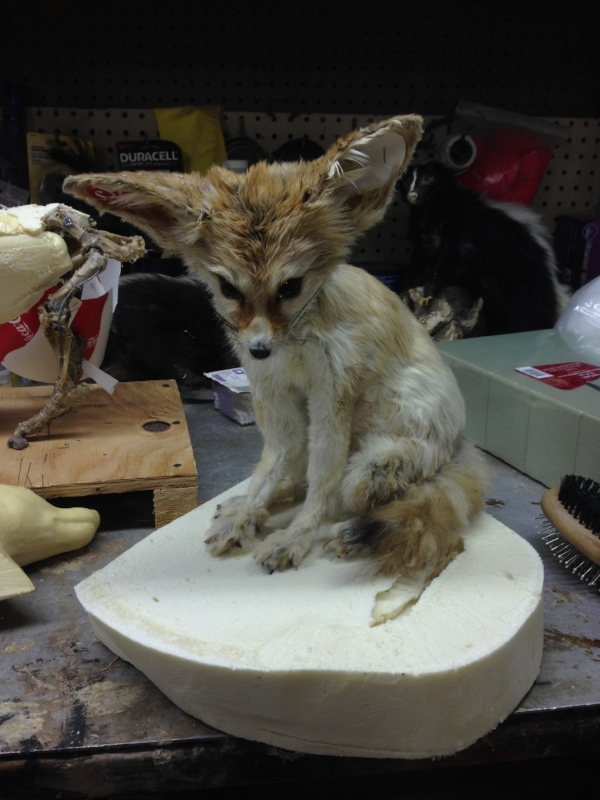 Here is a photo of how the fennec's face began to take shape. In between setting the facial features and tucking the lips, I also created a custom form for the inside of the body, inserted it, and sewed the back of the fox up. It still looks rough around the edges! 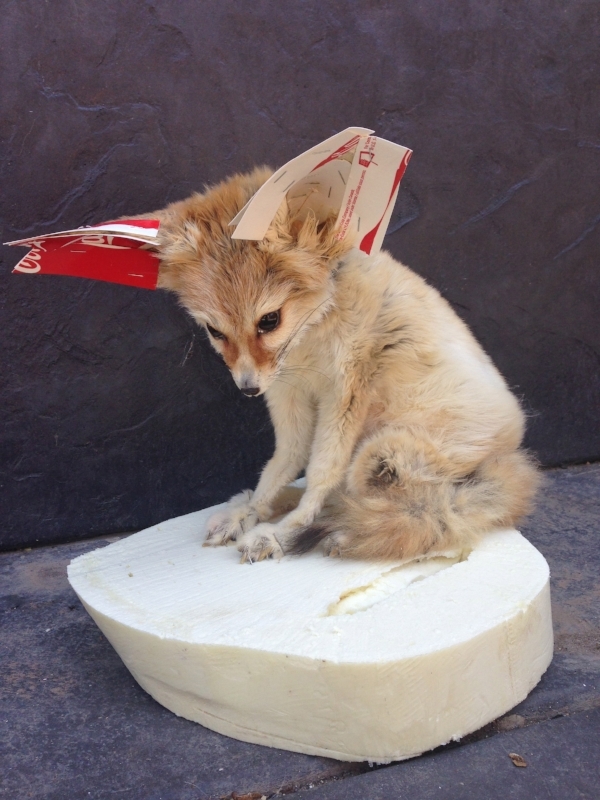 After a taxidermy project is posed to dry, there are typically still a few things that are rough around the edges. After the curing process, the pins and staples are removed. The cardboard stapled to the earliners is discarded, putty is used to repair any damage or holes, and the ears, eyes, nose, and lips get airbrushed. In addition, the animal is removed from its temporary base and placed on a permanent one, either something made of plain wood or something with a naturalistic environment. The plans I have for this guy include a habitat base with a butterfly or a bug on the ground. You can't even tell he was nearly beyond repair when I started! It'll be another few weeks before I am able to get back into my studio and do all the finishing touches, but here's a photo of me and Chuck with some things we worked on together. Please do not practice taxidermy without a proper license when one is necessary. Local, state, and federal laws vary from place to place and it is your responsibility to make sure you are doing what is right. This is a comprehensive series of images from a taxidermy project, not a guide to the entire process - if you are a beginner, please do not assume that what I've shown you in this post is the entire taxidermy process from start to finish, or you could end up with a mess on your hands. Take a class where you are supervised by a licensed professional so you don't injure yourself!